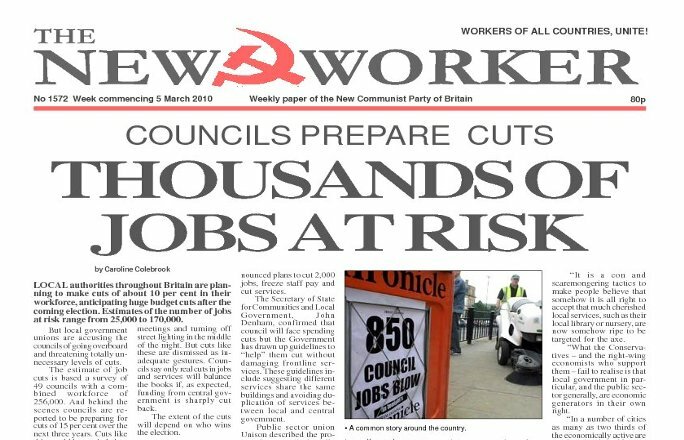 LOCAL authorities throughout Britain are planning to make cuts of about 10 per cent in their workforce, anticipating huge budget cuts after the coming election. Estimates of the number of jobs at risk range from 25,000 to 170,000. GOOD NEWS. It's not often we can say this but the collapse of the Tory lead in the opinion polls - to just two per cent in the Sunday Times YouGov poll means we are far less likely to get Cameron as Prime Minister later this year, when just a few months ago it seemed a foregone conclusion.